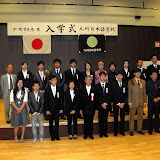 We had an entrance ceremony for 2011 April students. 19 students from many countries enrolled in Kyushu Japanese Language School. We will work together for your wishes come true!